Why should I enroll my child at Childgarden? What are the ages of the children enrolled at Childgarden? How can I stay informed and connected as a parent? Our Philosophy. Our Diverse Students. Our Inclusive Classrooms. Childgarden is open Monday through Friday from 7am-6pm. We want to make sure that Childgarden is the best fit for your family. Our enrollment process begins with a tour of our center. Please visit our enrollment page for step by step instructions on how to begin your child’s enrollment in Childgarden. 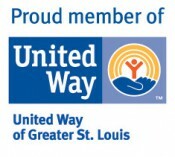 Childgarden is a licensed childcare center, licensed by the state of Missouri. In addition, Childgarden is voluntarily accredited by the Council on Quality and Leadership (CQL). We strongly encourage families to come tour our center! This visit will help you learn more about our philosophy and goals. Tours are scheduled individually providing you the opportunity to ask any questions you may have specific to your child. Contact us to set up your tour today! Individual classroom teachers communicate one-on-one with families daily through emails, notes send home with the child, and face to face discussion at the center. Our director communicates with our families once a month via email to share updates and news about the center. Families can also visit our Current Families page to learn more about upcoming events, volunteer opportunities, and important announcements. Childgarden has rolling enrollment, meaning you can apply at any time. Click here to start the process!